Will World Religions Stand in Support of Justice from Ferguson to Palestine? Home/Interfaith /Will World Religions Stand in Support of Justice from Ferguson to Palestine? “Where is peace? Wherever you let peace in! I cannot stand here before you today, without praying that the wounds of the holocaust and genocide for all people are healed, and that there is justice for my cousins the Palestinian people. From Ferguson, where black lives matter, to Gaza — may this be the year that we bring down all the walls of separation and make justice happen in our time!” concluded Rabbi Lynn Gottlieb in her prayer at the opening ceremony. Immediately, nearly 10,000 people leapt to their feet in a standing ovation, resounding in applause for Rabbi Lynn’s heartfelt invocation of peace with justice. 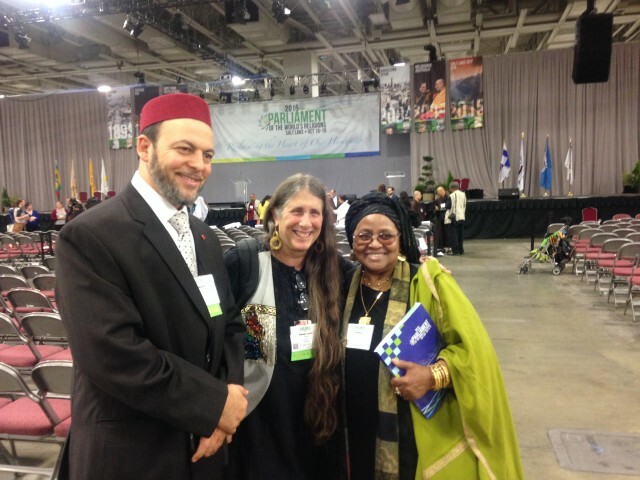 And so began the Parliament of World Religions, held in Salt Lake City, October 15-19. Over five days, the Parliament gathered thousands of leaders and practitioners from an array of faiths and countries to engage in plenaries and panels focused on topics ranging from countering climate change, uplifting women’s and indigenous rights, and ending war, to responding to islamophobia, racism, and violence in our communities. And Jewish Voice for Peace was there. Ritual co-leaders, ordained Kohenet Hebrew priestesses Rabbi Sarah Bracha Gershuny and Rae Abileah, invited participants into a meditation and writing exercise to acknowledge our collective and personal complicity in violence and war, releasing what no longer serves us and avowing to take action. 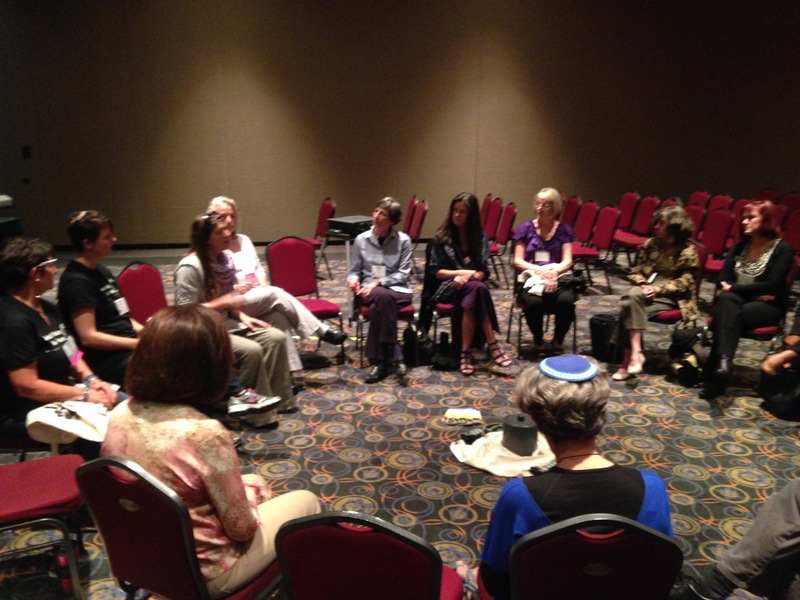 Participants came to learn more about Judaism, to get a better understanding about what’s happening in the Middle East, and to engage in interfaith ritual, and they left with both facts and heart space reflections. A Muslim woman in the audience asked about how to deal with the ongoing censorship of the Jewish Federation in her city, who work to prohibit groups like JVP from being at the table on important coalitions that she is working on. This question led to a conversation on the tactics of boycott and divestment and a look at how these tactics are a useful, nonviolent approach to countering the occupation, and shouldn’t be a red line for community engagement. 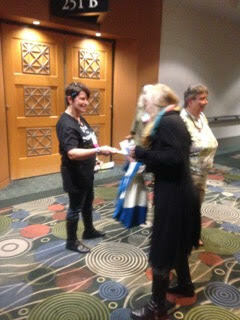 There were literally dozens of speakers at each plenary, including many who traveled from all corners of the globe. We were inspired by the strong calls against war and hate crimes from Parliament Board Chair Imam Abdul Malik Mujahid, CODEPINK cofounder Medea Benjamin, Nobel Peace Prize recipient Mairead Maguire, Black Lives Matter activist Pastor Mike McBride, Dr. Vandana Shiva, and Ret. Col. Ann Wright. And to hear Emma’s Revolution sing Peace, Salaam, Shalom on the big stage backed by 60 kids from the local Utah children’s choir, Up With Kids, was riveting! Throughout the Parliament, JVPers attended innumerable sessions and distributed hundreds of JVP flyers to interested interfaith participants. 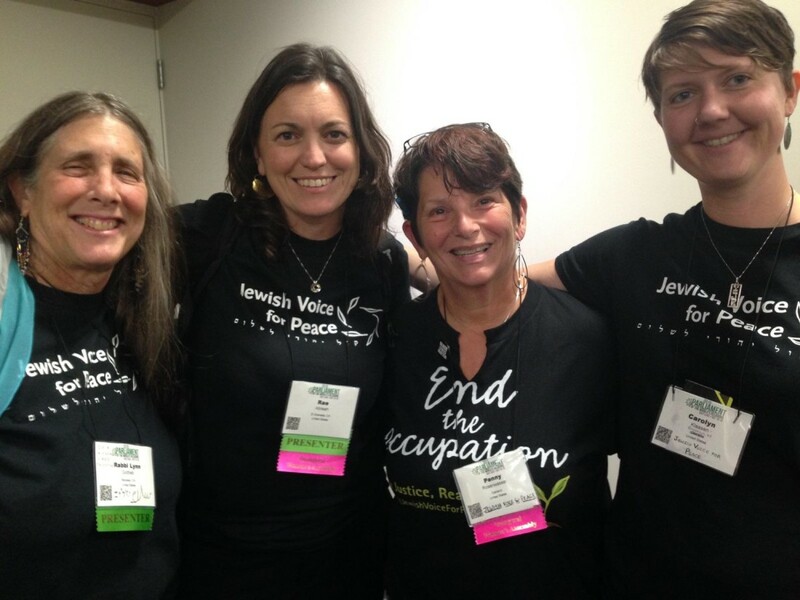 By wearing our JVP shirts, we were a magnet for a constant stream of people approaching us with thanks for the work of JVP, snapping photos, and questions about how to get further engaged or ally with a local JVP chapter in their area. Presbyterians who had helped pass their church-wide divestment resolution in 2014 approached us with high fives and queries. 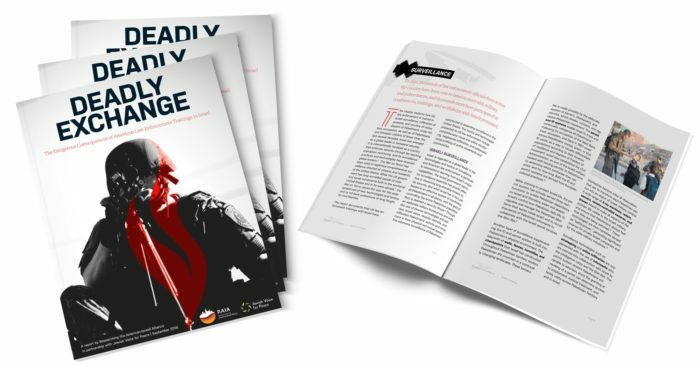 We were surprised and grateful to receive so much positive feedback for the work and the presence of a Jewish voice advocating justice and an end to the occupation. In fact, our JVP literature was displayed prominently in the Jewish resource room at this large interfaith conference. There was an added important to our presence at the Parliament given the news headlines and current elevated tensions in Jerusalem and throughout Israel-Palestine. Interfaith dialogue was a popular topic at the Parliament, with numerous packed sessions focusing on topics such as Muslim-Jewish dialogue projects in the United States, how Islamophobia plays out in the US, how to move forward when hard topics arise in interfaith partnerships, and communities of Israelis and Palestinians who come together for dialogue. With so many experienced, passionate delegates gathered in Salt Lake City, there were opportunities for exchanging inspiring stories and practical tips for strengthening our work. The power of interfaith dialogue is that it brings together people who are otherwise separated by so many factors other than religion. The temporary space of the conversation allows for moments of real human connection, moments that can be transformative in our understanding of ourselves and of people from other communities. Many at the Parliament spoke with powerful hope that such conversations may lead to greater peace in the world. But for that to happen, we cannot just learn to talk to each other. Rather, we must take action to transform systems of injustice so that we can actually live and engage as equals in this world. We must work together, not just talk together. The power of interfaith dialogue is that it allows for real human connection between people who may otherwise never connect, whether because of religious, class, ethnic, or gender divides. These moments that can be transformative in our understanding of ourselves and of people from “other” communities. But they necessitate a next step: we must take action together to transform systems of injustice so that we can actually live and engage as equals in this world. It’s our hope that the next Parliament may focus not only on panel discussions, but on tangible actions, and real steps forward. We must work together, not just talk together. This was the subject of an interactive workshop Carolyn Klaasen co-facilitated with Victor Begg on the last morning of the Parliament. Reminded by one of the teenagers in the room that very nice people participate in oppressive systems, and so our work as faith communities is to change those systems rather than simply helping people be nice to each other, participants shared their frustrations, successes, tactics and tips with each other. In our conversations at the Parliament, we repeatedly heard hopes that our religious traditions can be forces of positive change in the world, combating police brutality and racial injustice from Ferguson to Gaza, and uplifting human rights and security, from Syria to India and beyond. In Jewish Voice for Peace, we’ve found that our strongest interfaith relationships have been built by struggling together, whether in combatting anti-semitism and Islamophobia or to end the occupation of Palestine and bring equal rights and justice to all Palestinians and Israelis. Co-resistance, we believe, is the path to coexistence. Want to be a part of the power of interfaith work? 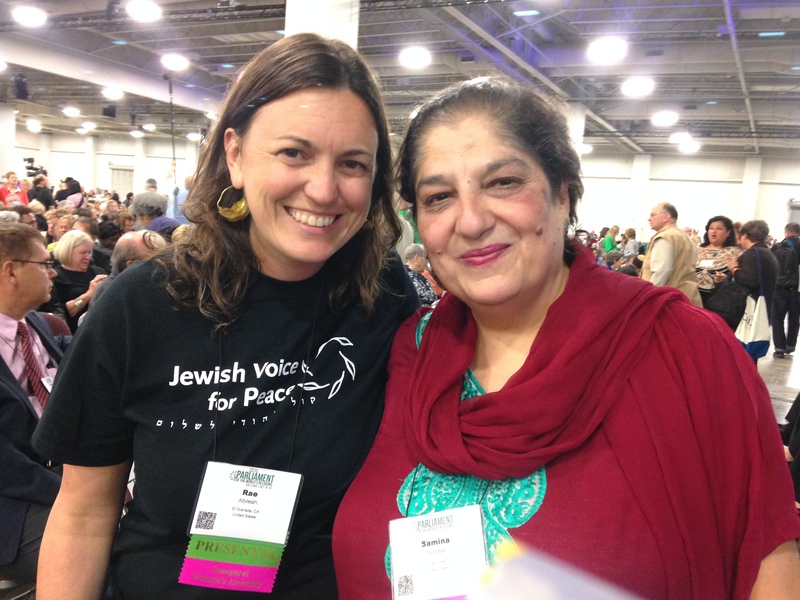 Connect to our emergent Interfaith Network for Justice in Palestine. Carolyn Klaasen is a doctoral student in Hebrew Bible at Union Theological Seminary in the city of New York, with a particular interest in the Bible’s violent narratives. She is an active member of Jewish Voice for Peace.